Now that the cats have a new feeding stand, an old wood project from my high school years can be touched up and used for something else. Woot! So a long time ago I decided to make a new stand for my dad’s stereo/record player (hence no top) for a shop project. Even with careful measuring and well meaning plans, the stereo didn’t fit my thoughtfully made stand. Even now, I know where I had made my mistake, but all the shop terms and lingo have long escaped my mind that I can’t correctly explain my error. 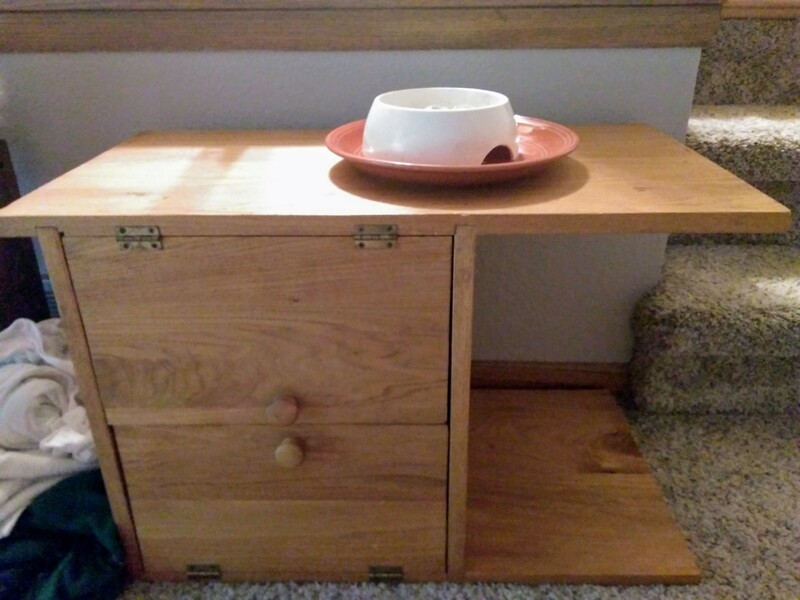 A few years ago, Becky finally returned the stand to me, and it was used to hold a canvas bin and then a feeding stand for the cats. 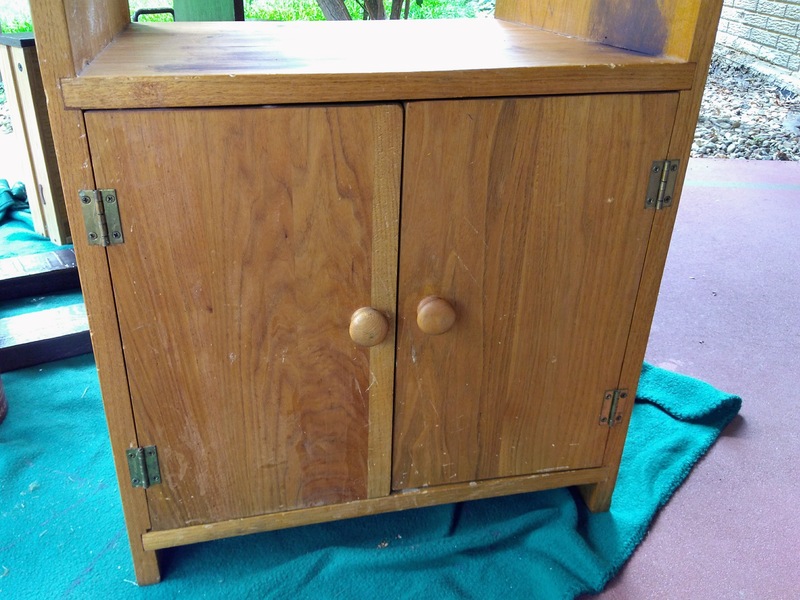 I’m not quite sure what happened to the proposed stereo stand after all these years, and despite all the nicks, scratches and unexplained color splatter (the brown streaks were my test to check if I should use a primer before slathering it in brown paint), it still holds up. My craftsmanship is just amazing! Maybe I should have my own show on HGTV. 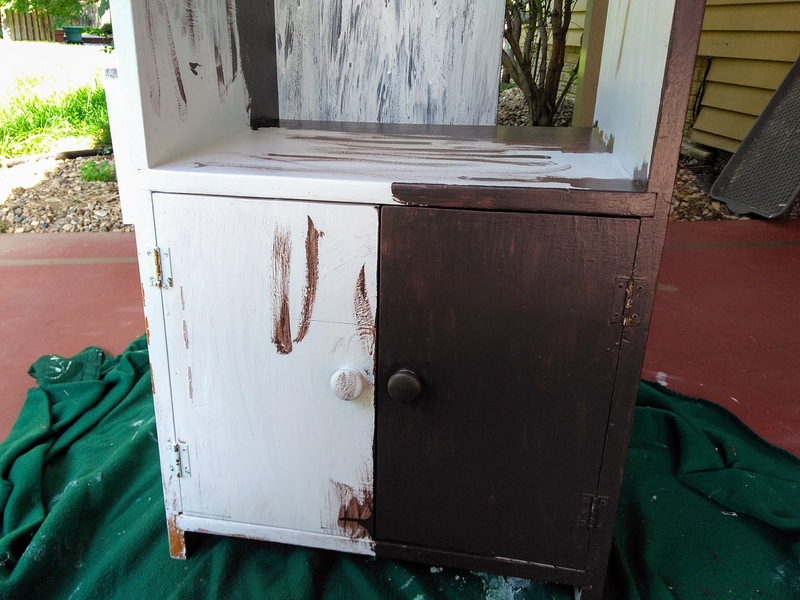 The stand was finished with a stain so I guess I needed a primer to help the brown paint adhere. To be honest, I’m still learning what items should be primed before painting. And if I prime, can I use old leftover paint AND primer (as most paints these days are) for my base? Or do I need a special primer? 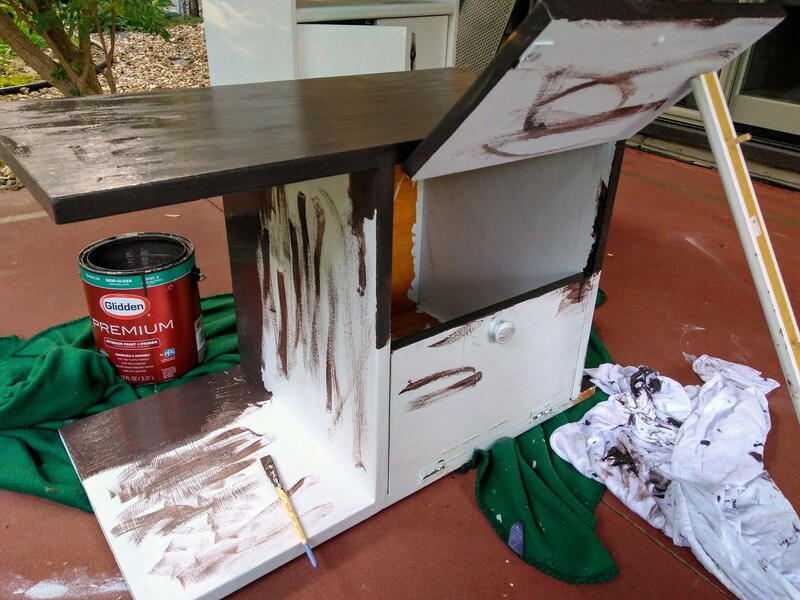 I had plenty of old leftover paint plus primer that I had used as a primer on the step stool and the cats’ new feeding stand so I just used that instead of running to the hardware store. 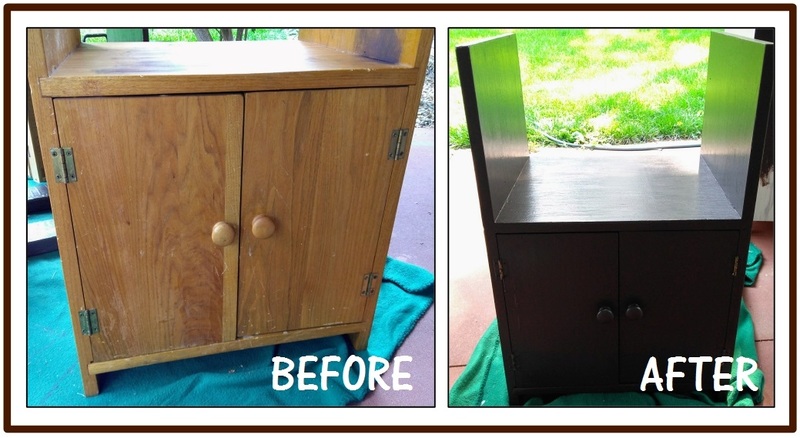 I am so new to repurposing old furniture into something new that I don’t even know how many prime coats are needed. One? Two? Since I have no idea I have been using one coat of prime before focusing on the brown paint. Stupid Pinterest projects — the pins look so easy. 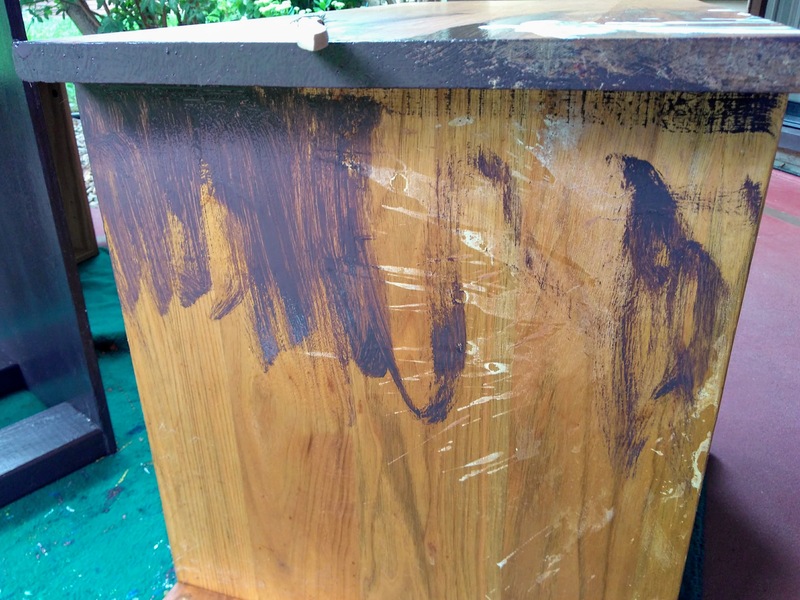 I spent a few days painting the stereo stand a deep rich brown that I had used on the feeding stand and the step stool, which leads me to a question. Does all the decor in the house need to match? Our color scheme is a basic rich brown — the reclining couch, TV cubicle stand, and some other small pieces are all deep brown. Should everything match? Or should I throw caution to the wind and paint something red or gray or some other color that complements the color scheme? This is why I’m not an interior designer. Anyway, after days of painting and touching up small areas the stand was ready for the final top coat. A sealant, I guess. Have I mentioned I’m not a professional painter? Riley gives me the stink eye because I won’t let him outside (he’s an indoor cat). 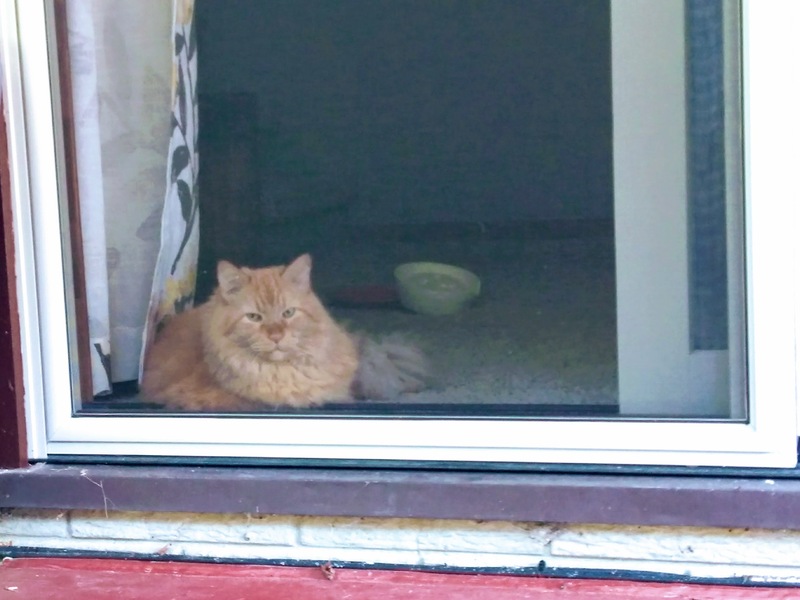 The patio screen door is used when someone can keep an eye on the furry little turd because he likes to press his body weight against the screen to pop it out. In the background of the picture, do you see the upside down food dish? That’s his handiwork and the reason for the new feeding stand. I love my little troublemaker. Who can resist that big ball of orange fur? 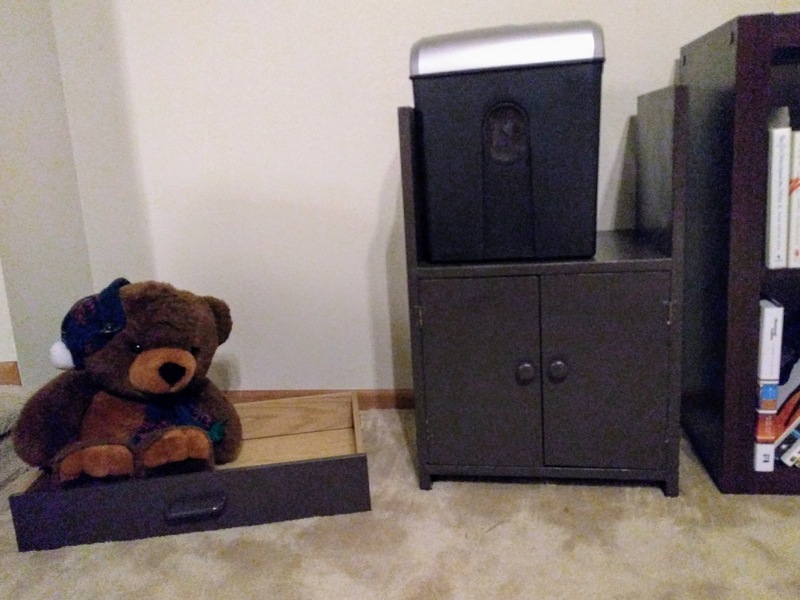 I decided the old stereo stand is the perfect place for the paper shredder to sit on top and binders containing important paperwork inside the cabinet. A slim magazine holder — to house documents ready for the shredder — will fill the small space between the paper shredder and the right edge. 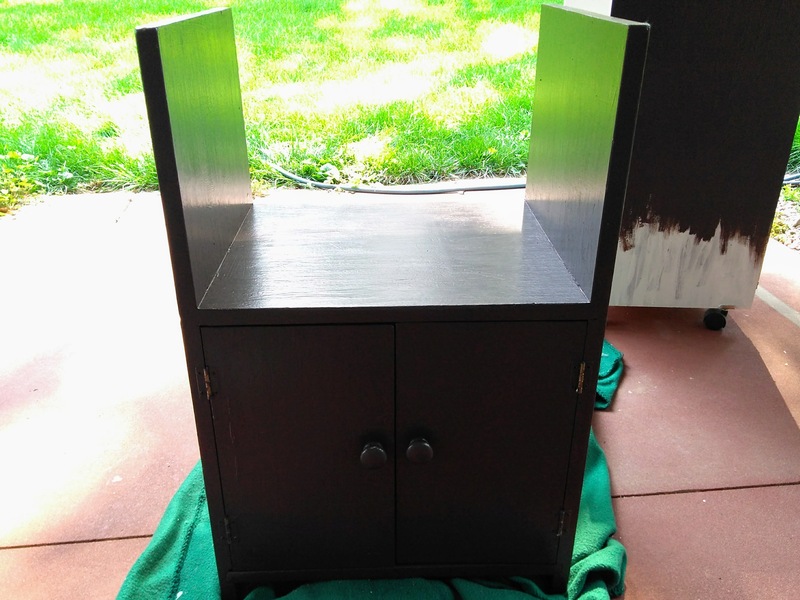 Once the previously white cabinet stand is ready for use, it will go next to the paper shredder stand and be filled with office supplies.